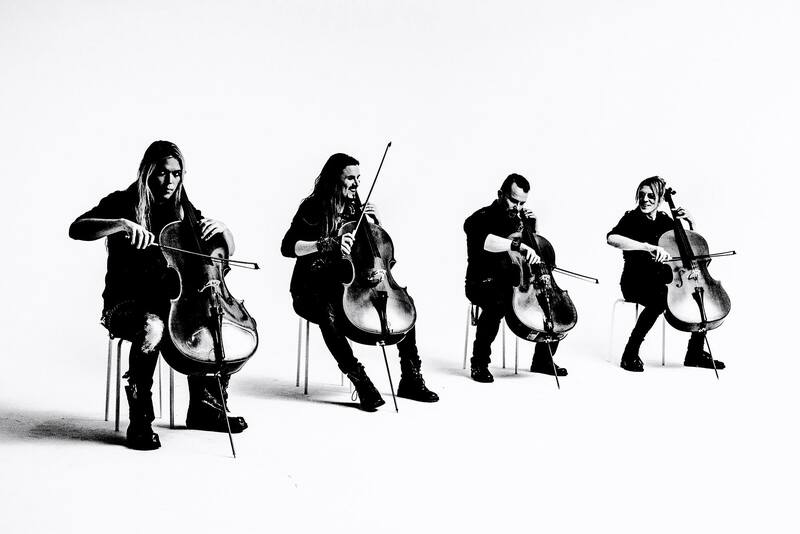 It’s hard to believe that 20 years have passed since the release of ‘Plays Metallica by Four Cellos’ by Apocalyptica, a band’s first album that brought quite a spotlight on a humble quartet of Finnish cellists. Fast forward to 2017, the band has released 8 albums and received a world-wide appreciation. And 23rd of October saw Apocalyptica taking on a first show of the European tour in a beautiful Carre Theater in Amsterdam. The event was sold out and to a dismay of attendees, that turned into long queues with a limited throughput. By the time the band appeared on stage, people were still settling in trying to find their places. The band probably decided not to complicate things and dedicate the first part of the show to playing the debut album in a chronological order, opening the show with ‘Enter Sandman’. And while the lights did exit, part of the audience was still on the move and barely enjoyed the opener. The band moved across the album in a chronological order, blasting out amazing renditions of ‘Master of Puppets’ and ‘Harvester of Sorrow’. If there were any doubts, whether the band still remembered how to play 20-years old material, those doubts were gone quite fast. The band greeted the audience and requested to help with vocals for the rest of the songs. The request was met with huge appreciation, yet when the time has come to sing along to a beautiful ’Unforgiven’, weirdly enough fans fell pretty silent, probably enjoying the show or just singing to themselves. Singing or not, but audience seemed to be enjoying the aggression of ’Sad But True’ and ‘Creeping Death’ a lot, eventually greeting the band with a standing ovation. And a well-deserved one, since the band, with few small exceptions, was performing like a tuned clock. The last track of an album, ‘Welcome Home (Sanitarium)’, was rightfully dedicated to one of the founding fathers of the band, Antero Manninen, who rejoined the band for this tour. It was his interpretation of that song’s solo, that made it to the album, so it was only appropriate for him to lay out the piece live. On that positive note, the time for intermission came. After a short break, the show had to go on and the drum stand appeared on stage. That meant one thing – the things are about to get loud! To the general appreciation, Mikko the drummer made it on stage and band quickly launched into ‘Fade To Black’ and ‘Until It Sleeps’. And oh miracle, it was during ‘Until It Sleeps’, when the audience finally woke up from a trans and got loud. Maybe it was the drums’ effect, or maybe it was because of Perttu attempting to breathe life into a crowd, but the fans started to sing and sing quite loud. A quick episode of standup comedy by Perttu followed, jokes aside, it was apparent the band was in the mood to deliver and did exactly that. ‘Orion’, ‘Escape’ and ‘Battery’ performances followed, a trio of songs that showcased the full power of the band, literally and figuratively, with Eicca shattering few strings and masterfully replacing them all under 30 seconds. It was definitely the most technically challenging part of the show, yet the most satisfying for everyone participating. And if it wasn’t enough, the band went on to play ‘Seek and Destroy’, bringing the house down. Raw energy streamed from the stage and for a second, one could have worried about the venue’s intactness. With the last chords, the band duly left the stage, only to be summoned back in few minutes by the crowd shouting “We want more!” at top of the lungs. The encore, the icing on the cake of the evening, came in form of killer duo, ‘Nothing Else Matters’ and ‘One’. There’s been enough said about these tracks and playing them by four cellos could only make it sound even deeper. That wrapped up the evening of celebration of two amazing bands. We surely will see these Finnish folks down the line again!